Contact me for a free appraisal of what can be done to reverse the effects of accidents, neglect and time. A 19th century oil painting of sheep by Rosa Bonheur (French, 1822-1899) was heading for obscurity when rescued by a pair of collectors. Careful restoration saved it from further damage. The video above describes the processes used to revive it. This is especially evident in paintings which have never been varnished. 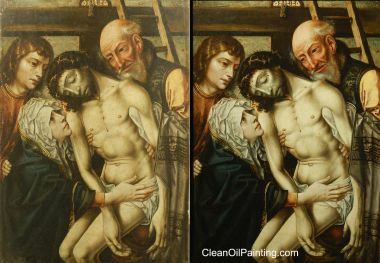 Cleaning and nourishing the paint surface, followed by varnishing, can restore the colors to reflect the artist's original vision. Professional color matching, inpainting and retouching. Non-yellowing protective varnish with UV light filtering qualities provides long-lasting surface protection. Fragile canvasses can be mounted on a variety of new surfaces including polyester canvas, Mylar and hardboards. Contemporary museum-quality archival adhesives and methods are used. 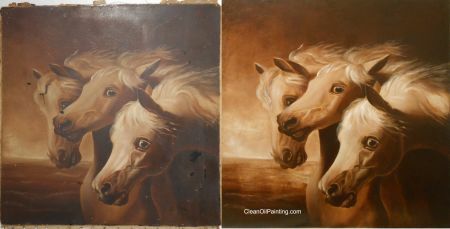 Relining stabilizes the painting and relaxes the paint film. It also retards the progression of stress cracks and other damage caused by uneven tension, flexing and mishandling. We are glad to provide repair estimates for insurance claims. This lovely woman (Recently recognized as Virginia Woolf) was painted by Boston artist Mary Catherine Callan in the early 1900's. 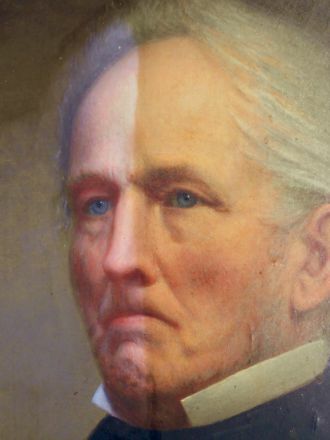 Somewhere between then and now, the portrait collected a thick layer of grime and a few punctures. The ear was almost totally lost. 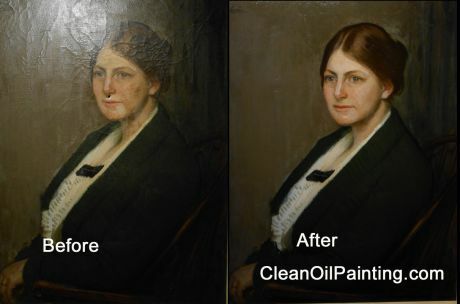 Clean Oil Paintings is a major underwriter of Downton Abbey on RIPBS. 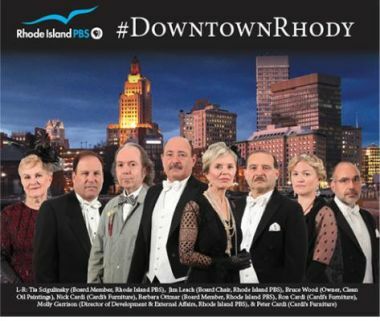 Conservator Bruce Wood, the Cardi Brothers (Cardi's Furniture) and an illustrious cast of RIPBS Celebrities joined together to create their own version of the popular series. See the video here. 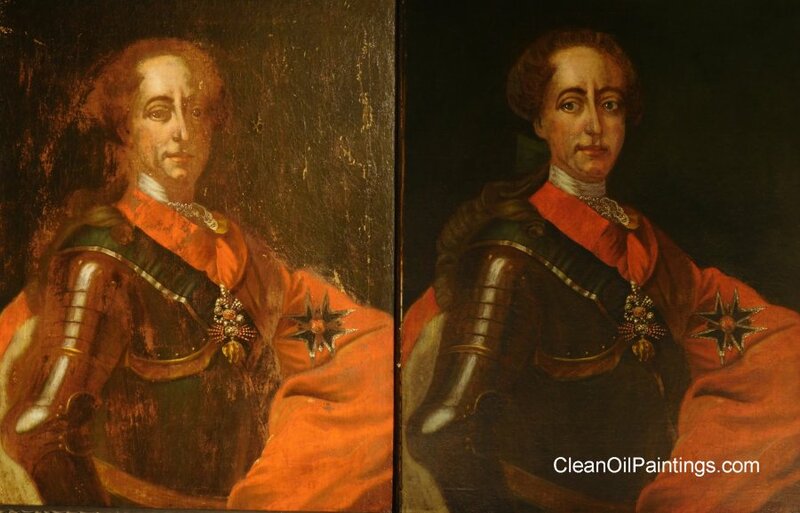 This 18th century portrait of Maximilian III, from the workshop of George Desmar�es, had lost most of its paint! The face and details were carefully reconstructed, based on the remaining outlines and bits of pigment. 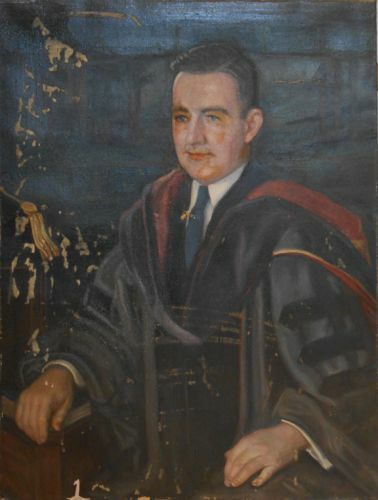 Restored Early 19th Century portrait with collector Lawrence Branagan. 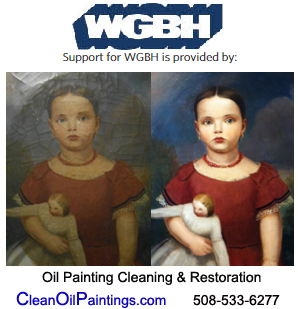 A detail of an Edward Potthast painting shows how cleaning and varnishing can restore colors and contrast. 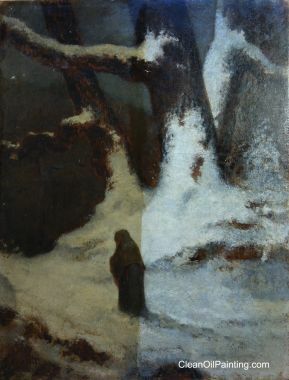 A mid-1800's winter scene by William Morris Hunt had been hanging over a fireplace mantel for a century. Here it is with the soot partially removed. 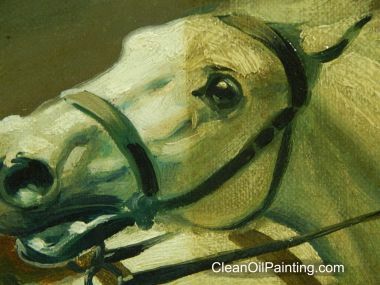 Detail from a painting of a cavalry charge, showing a horse returning to its original color. is well. It arrived looking fabulous! of the old, tattered piece I sent you. Now I really have a work of art! 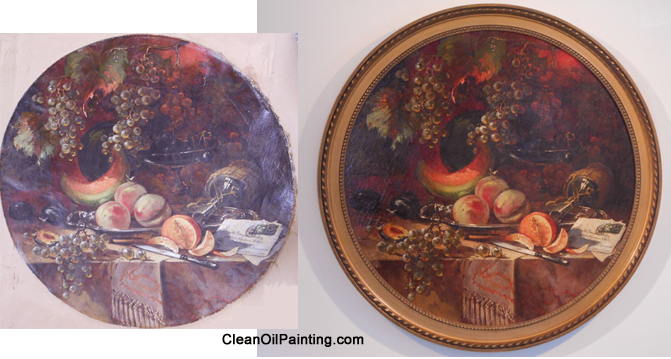 The antique oil painting above had a heavy layer of smoke and discolored varnish. 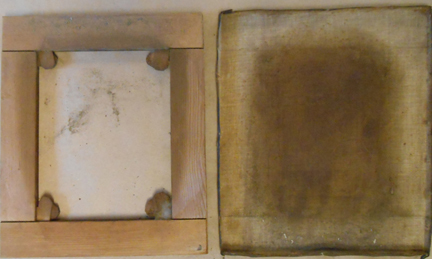 The smoke is visible on the back of the canvas (shown on the far right, removed from its stretcher bars.) There was also pronounced cracking and cupping of the paint. 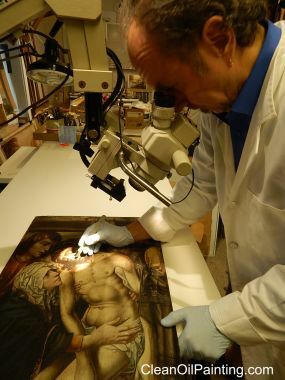 The painting was relined onto a sealed piece of new linen, flattened and stabilized before cleaning. 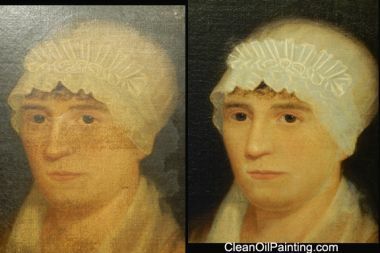 The middle photo shows the painting during the cleaning process. 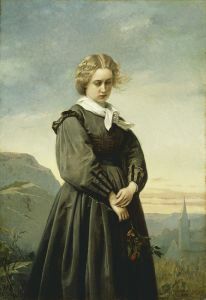 Note the color of the sky and cobblestone street on the left side of the painting. The far right photo shows the results after cleaning and varnishing with a non-yellowing, ultraviolet protecting archival varnish. 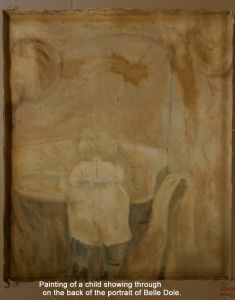 This early 20th Century oil painting on paper-board suffered from neglect and a bad fall. The fragile corners were mashed and broken, and it had several gouges in the surface. The pieces were re-assembled and mounted onto a new board for stability. 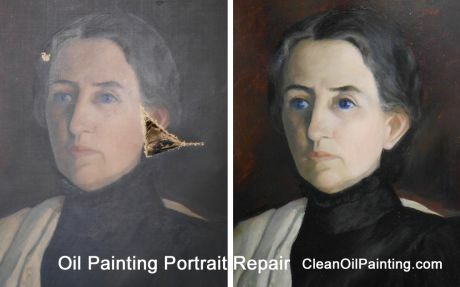 Then the painting was cleaned, cracks repaired, and careful retouching finished the job. Humidity and shrinking had caused this c.1900 naive Hudson River School painting on canvas to rip itself apart. It was lined onto a layer of polyester canvas and then onto a rigid board. After cleaning, repairing the tears and in-painting the paint losses, a final coat of non-yellowing varnish brought out all of the beautiful details. and clean away several layers of old dirt and varnish. 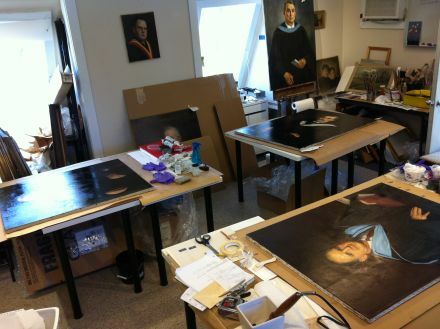 This view of our studio shows paintings of the Presidents of Dean College in various stages of cleaning and repair. The photo on the right is a detail of the 1864 portrait of Dean College's Founder Oliver Dean during cleaning and varnish removal. with a large rip and heavily cracking paint. old varnish and filling the damaged areas returned her beauty. 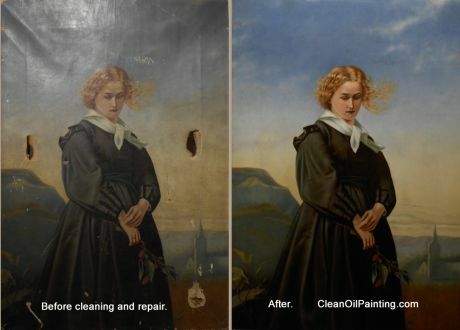 The original round stretcher on the painting above had deteriorated, warped and shrunk, causing the paint to buckle and crack. 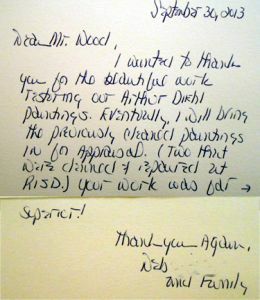 The paint was relaxed and the canvas was relined onto a hardboard for stability. Cleaning and revarnishing restored the lost colors and details. 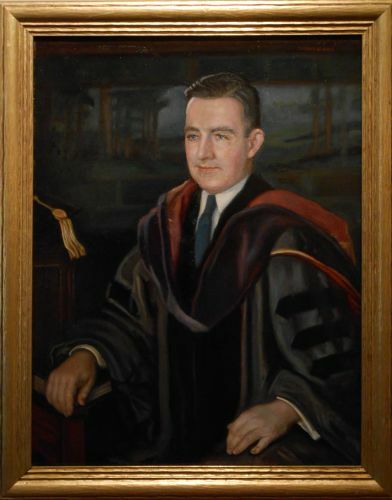 This oil portrait had been wrapped in newspaper and stored in a hot attic for decades. the colors have returned to what the artist intended. 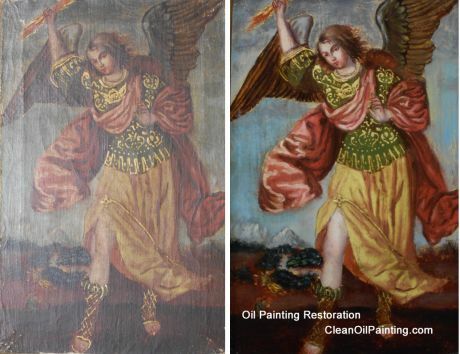 Rips were repaired, and years of dirt and discolored varnish were removed from this circa 1900 painting of Venice. and off-color paint from an old restoration. 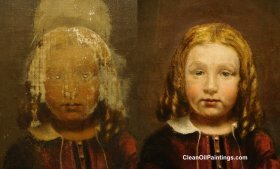 When uncovering the back of the painting, we discovered that the artist painted Mrs. Dole on top of a painting of a child! The outlines of the original image can be seen in the above photo of the back of the canvas. 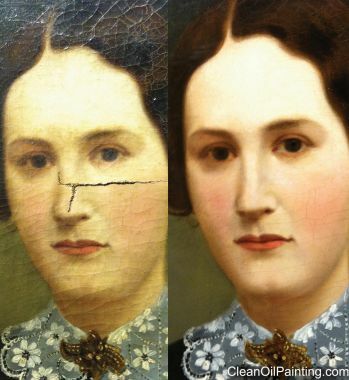 The portrait received a vapor treatment to relax the cracks, and was lined onto archival polyester canvas to reinforce it. 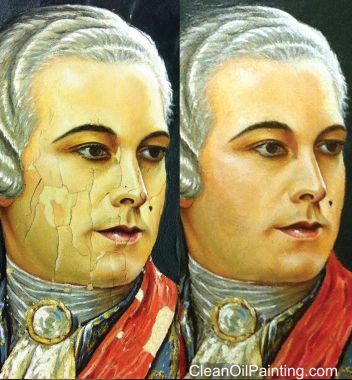 The old varnish was removed, the puncture was repaired, and the face was in-painted and retouched. After a coat of non-yellowing varnish, Belle looks like she's returned from a spa. The photos below show the progress of cleaning a small (14"x14") oil painting of a mill by Macowin Tuttle (1861-1935). energetic brush work. 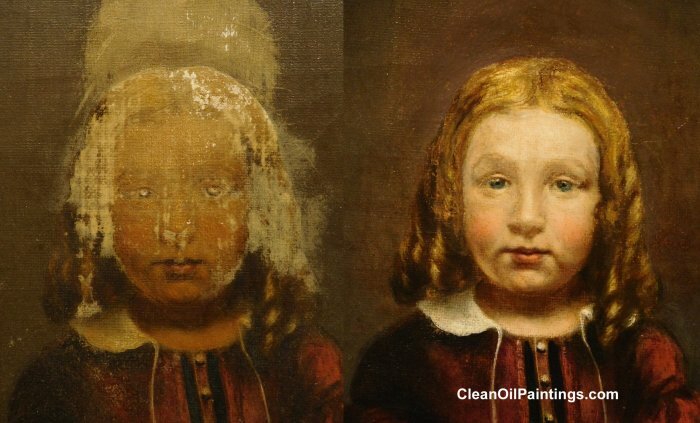 The painting appears to date from around 1900.
by discolored varnish and layers of household smoke and grease. It also revealed some old repairs, where the retoucher matched the color of the dirt! These can be seen as dark green blotches in the tree branches, center left. 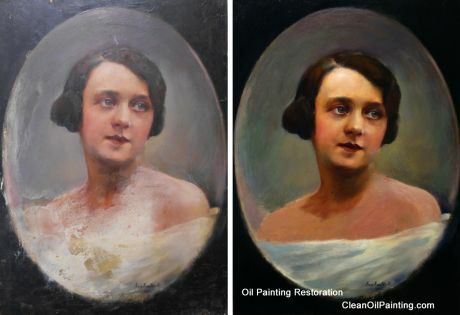 The old retouching was completely removed and lightly inpainted with appropriate coloration and impasto. 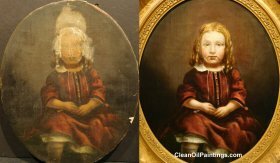 This early 19th century portrait benefited from lining, cleaning and a bit of restoration of the missing paint. Cleaning revealed many hidden details in this mid 19th century Anglo/Continental landscape. 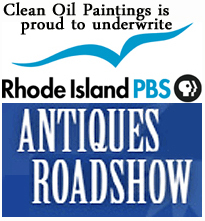 Hosted By Conservator & Auctioneer Bruce Wood.